U.S. Army Sgt. Jeremy R. Squires, and Army Sgt..Ronald F. Williams, from Chicago, Ill., in the foreground, both generator mechanics, with Army Sgt. 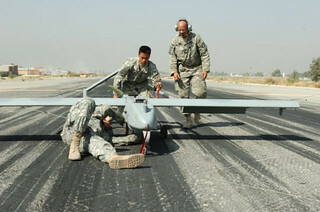 Anh M. Huynh, from Philadelphia, Pa., an electronic technician in the rear, all with the 173rd Airborne Combat Team, Bravo Company, Special Troops Battalion, attend to a Shadow Unmanned Aerial Vehicle October 17 at Forward Operating Base Fenty, Jalalabad Airfield, Afghanistan. After landing the Shadow UAV is stopped using an arresting hook cable system similar to jets on an aircraft carrier. (U.S. Army photo by Spc. Gregory J. Argentieri).